I thought of making this card for someone who is suffering from cancer and will have this card with gorgeous hand made flowers next to her bed. Also, this card would be used for a sympathy card. I made this book card template, click HERE and enlarged the template using a word document software measuring 6” x 9 ½”. Enlarge each template by ¼” and print. If you don’t have a printer large enough, any print store will do it for you. Trace the smallest template on the Heartfelt Creations Arianna Blooms paper. Trace and cut the other two templates on Bazzill yellow and blue card stocks. Adhere each page on top of each other. 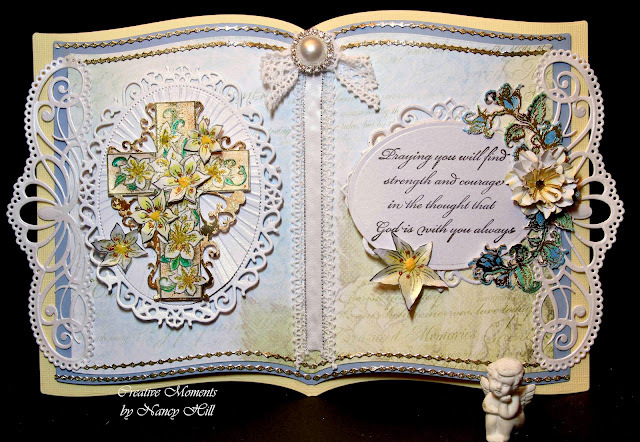 Using the Cross and Lilies die set, stamp and color the cross with Copic Markers, G11, E13 and YG13. Cut the background cross with gold metallic card stock and cut the cross out with scissor and adhere together. Using 3-D foam tape, tape the cross to the decorative oval. Shape the lilies and Arianna flower with the Heartfelt Creations shaping kit. For in depth instructions see the video, click HERE. Adhere the lilies on the cross and apply NUVO Crystal Drops – Dandelion Yellow in the center of each lily. Color the Heartfelt Creations roses with Copic Marker B12 and adhere to the card. Adhere the Arianna Bloom flower on the center of the rose buds. Cut out the Regal Border and adhere to the card. Stamp the sentiment on white/gold shimmer card stock and cut using the oval die. Adhere to the Raindrop on Roses die cut and adhere to card. Adhere the lace to the center of the card and cut 5 ½” white/silver ribbon and adhere to lace. Adhere the rhinestone pearl to the lace. Stick the self-adhesive border strips to the top and bottom of the first two book pages. Cut 7 ½” x 12 ½” and score in the center and adhere this to the back of the book. In the Heartfelt Creations Arianna Bloom paper, cut 5” x 7” paper and adhere to the inside of the card. Stamp the sentiment with black ink on rose-colored card stock and die cut. Adhere this sentiment to the inside of the card.